Whether you ride through a snowy winter or a sandy summer, you know the havoc that salt can create when it comes to your bike. Even in the best trail conditions, rogue rocks, branches, and well, life in general, can take their toll. For these reasons, it's hard to argue against the merits of an aluminum construction, especially one as awesome as what's found on our Fatboy Comp. It provides the perfect blend of efficiency and durability, so you get a touch more security without sacrificing anything in the performance department. And in keeping with this theme, we spec'd it with a no-nonsense build that's hungry to perform on the trail, season after season. Once you go fat, you never go back. >The frame features an M4 alloy construction that provides the ideal blend of efficiency and durability, while the geometry creates a roomy top tube and short chainstays for easy climbing and confident descending. >A FACT carbon fiber fork provides tons of compliance and absorbs chatter, while simultaneously keeping the overall weight of the bike down. >Our Stout XC 90 alloy rims have been laced to Stout XC hubs to form a wheelset that's dependable, rugged, and efficient. So whether you're trail riding or plowing through the snow, these wheels will be the perfect mix of performance and strength. >26x.4.6" Ground Control tires help soak up bumps, while also providing a game-changing level of traction, control, and floatation for better handling out in the wild. >A Race Face Turbine Cinch one-by crankset features an alloy spindle for added strength and long-term durability, while also leading the way for an efficient, lightweight, and simplified drivetrain with plenty of gear range for hard drives on the flats and climbs. Specialized M4 aluminum, fully-butted tubing w/ smooth welds, tapered head tube, post-mount disc dropouts, 190mm rear hub spacing, replaceable alloy derailleur hanger. Specialized FACT carbon, full monocoque, tapered steerer, 135mm hub spacing, open QR dropouts. 1-1/8" upper, 1-1/2" lower, threadless, Campy style, cartridge bearings. Specialized XC, 3D forged alloy, 4-bolt, 6-degree rise. Specialized XC, butted 6061 alloy, 8-degree backsweep, 6-degree upsweep, 10mm rise, 31.8mm. Specialized Sip Grip, light lock-on, half-waffle, S/M: regular thickness, L/XL: XL thickness. Shimano Deore, hydraulic disc, dual piston, resin pads, Ice-Tech rotor. SRAM X0 Type 2.1, 10-speed, long cage. Custom Sunrace, wide range, 10-speed, 11-40t. KMC X10L, 10-speed, w/ reusable MissingLink. Race Face Turbine Cinch, PF30 BB, 100mm spindle, 28T direct mount ring. Specialized Bennies, 6061 alloy body, sealed cartridge, 4.5mm removable pins. 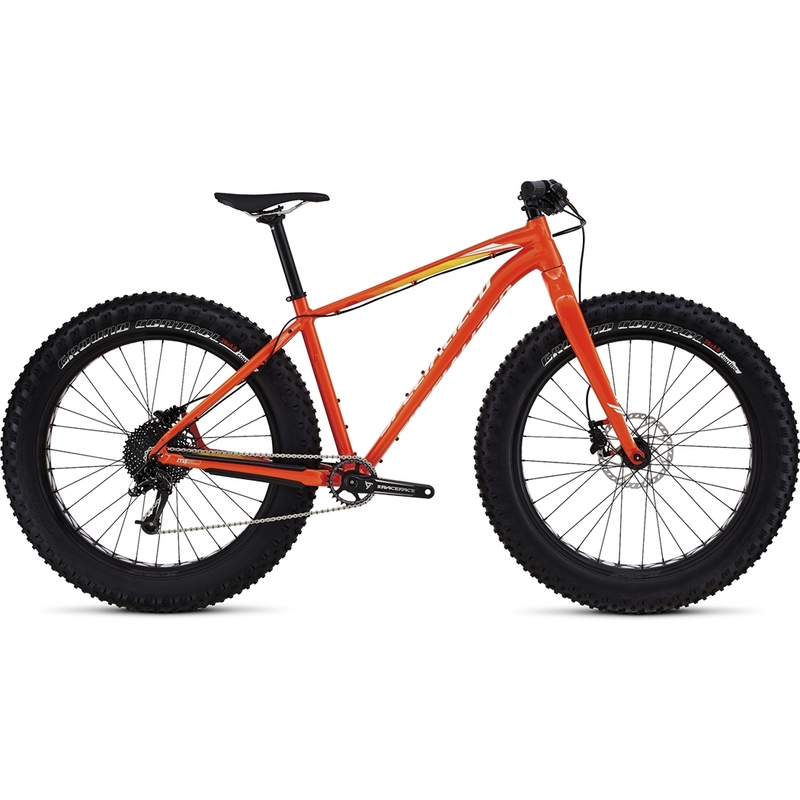 Specialized Stout XC 90, disc, alloy, single wall, 90mm wide, sleeve joint, hookless design, 32h. Specialized Stout XC 135, Hi Hi disc, alloy, sealed cartridge bearings, QR, 32h. Specialized Stout XC 190, Hi Hi disc, alloy, sealed cartridge bearings, QR, 32h. Specialized Ground Control Fat, 120TPI, folding bead, 26x4.6". Body Geometry Henge Comp, hollow Cr-Mo rails, 143mm. Alloy, 2-bolt, 12.5mm offset, 30.9mm, anti-corrosion hardware.